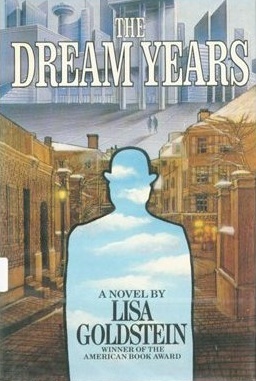 Lisa Goldstein’s 1985 novel, The Dream Years was a recommendation from Kev McVeigh following the announcement of a new set of books to be added to the Gollancz SF Masterworks and following from the discussions at Torque Control regarding women in SF. Though it’s a novel featuring time-travel, it’s quite hard to characterise it as being an out and out SF novel. Goldstein doesn’t really attempt any hand-waving SFnal explanations for the time-travel. Jo Walton suggests that it is ‘fantasy treated rigorously‘ – though she does note that it is also possible to define it as SF. I have to admit that I’m not overly confident that I would be happy to leap down off that particular fence. That said, the poking of this novel into a genre hole is of limited interest when you start to consider the quality of the Goldstein’s work. The Dream Years follows Robert St. Onge, friend of real life surrealist André Breton, as he searches for meaning in his life, whilst living on an allowance from his wealthy parents in 1920s Paris. Robert is part of the surrealist movement himself, but he often resents Breton’s (author of the Surrealist Manifesto) desire to control the movement. Robert wishes to write a novel (and is often scathing about some of the work that he and his fellow surrealists produce) but is heavily criticised by Breton who believes that the form is a dead and worthless art. After purchasing an unplayable record (it’s a vinyl LP from the 1960s, rather than a contemporary 78) with a colour picture of a beautiful woman (Solange – he meets her later) on the sleeve, Robert is told by a fortune teller in the market where the record stall was that he’ll be going on a long journey (but not so long; it’s to Paris). Robert finds himself carried to Paris in 1968 at the time of the attempt at student revolution. It’s worth noting that he doesn’t express a great deal of surprise at this; perhaps because he is a surrealist? The people rebelling in 1968 look to him as an important figure in the surrealist movement. He does seem a little perplexed by this, in light of his tussles with Breton, although as the novel progresses, he does quickly assert himself, to the extent that he, on more than one occasion, opines that it is he and not his friend that is the true surrealist. I felt, with both the surrealists and the 1968 revolution, that they were linked through a sense of a missed opportunity. The surrealists (as portrayed in the novel; I have to confess that my knowledge and understanding of them is somewhat superficial) and especially Robert, believe that the world of work to earn their living is a part of a past that they wish to have no part of. Robert is called through to the 1968 revolution, and the future, date unspecified, rebellion because those out on the streets have read his work and about him and believe that he can inspire them to victory. Of course, I, as the reader, know that the surrealists didn’t change French society in the way that they had hoped. Similarly, the 1968 revolution ultimately did not succeed. Indeed, the students on the streets had some support from the workers, but this union could not last because the bulk of workers didn’t wish to alter society; they wanted a greater share of the wealth created. More recognition for their contribution, in other words. I’m sure that the student revolutionaries were not homogeneous in their desires when digging up the paving stones and indeed there’s a high likelihood that many of those on the barricades ended up becoming a part of the establishment, but certainly – in the context of the novel – they were aligning themselves with the surrealists. As Robert flits back and forth between the Paris of 1968 and his own time he meets (and falls in love with) Solange, the woman on the LP sleeve. Whilst with those on the barricades he is able to consider his and his own friends place in history. I mentioned that the revolutions were ultimately unsuccessful, but Robert does note that there is something in that they are fighting to retain the sense of wonder and the desire to be free of the strictures placed on their lives by civilisation. Though, admittedly, strolling between two time periods could be considered pretty fantastical, the novel really enters fantastical territory towards the end. To this point, I’d felt a little sadness for the characters, given that their attempts to change the world were doomed to fail (if we take established history; it is fiction, so I suppose that had she wished, Goldstein could have made a happy ending for the 1968 revolutionaries at that time, that would have been a little lame, though). The revolutionaries from the sixties, Robert and André are pulled further into the future where a similar war is being fought against civilisation. One which seeks, again to free people from the strictures of civilisation. To allow them to live and work for themselves and no-one else. There are some wonderful descriptions of the conflict here, where the revolutionaries are using surrealism to counter the threat from the armed forces ranged against them. They are using the magic created by surrealism to peacefully fight their war. In this (and it hardly seems real – surreal if you will) there is some hope for the characters and their beliefs, which gives a little more meaning to the plight and hopes of the people in the novel. This is an excellent little novel and I (once again) extend a hearty thanks to Kev for his shout to Lisa Goldstein. She manages to bring the three versions of Paris to life and makes excellent use of the real life surrealists to create a distinctive and worthwhile fiction. This entry was posted in Review and tagged international womens day, lisa goldstein, novel, time travel. Bookmark the permalink. It is not true that the workers didn’t want power but merely wanted a greater share of the wealth created. Rather, both the workers and the students were defeated at the polls. It was the way that Democracy was reinstated that reestablished the normal functioning of Capitalism in France, and not any betrayal from workers. The Unions and their leadership were quite content to return to making demands for more, but the workers occupied the factories with the vague intent to take power.